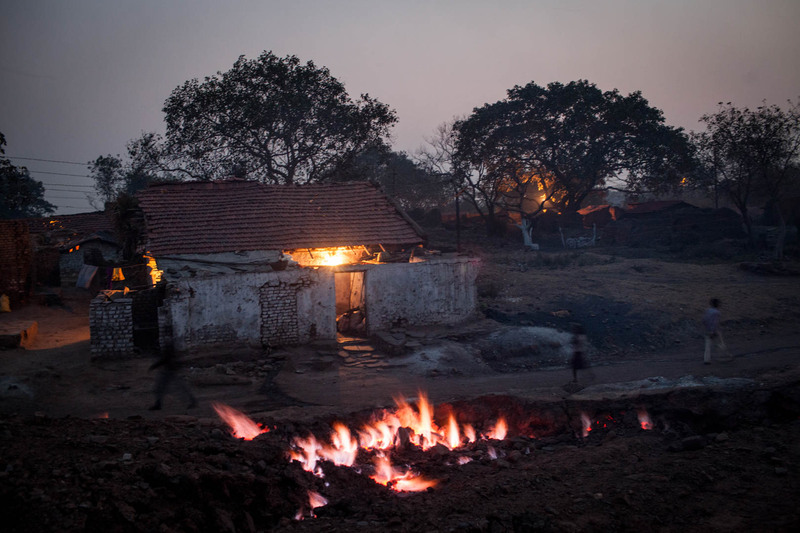 Around the city of Dhanbad, coal fires started to burn over a hundred years ago. Many people live right next to the burning coal, breathing the poisonous, sulphurous fumes every moment. Additionally, their homes can collapse any moment. Hundreds of Indians died from lung cancer over the last decades in this area. 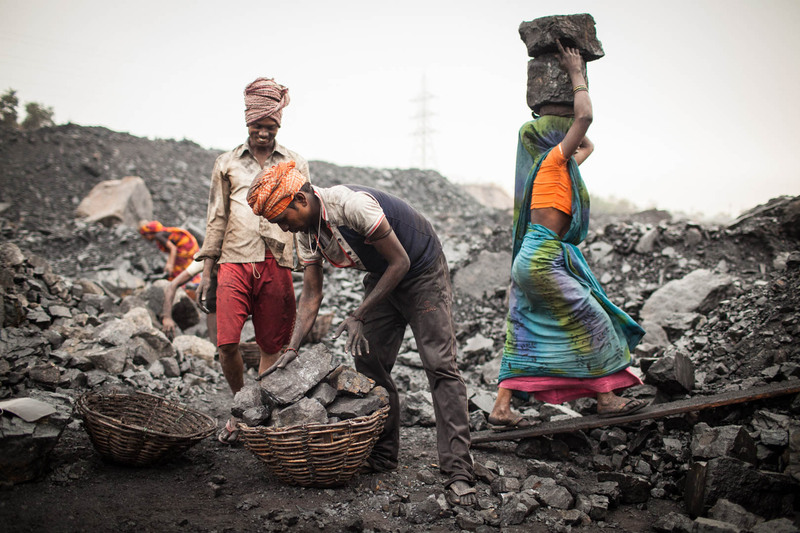 Two people carry coal that they have illegally collected in an open-cast mine run by the government around Dhanbad, shortly after sunrise. These people pay money to the guards of the mines to look away for a few hours, so that they can steal some coal to resell it on the streets. 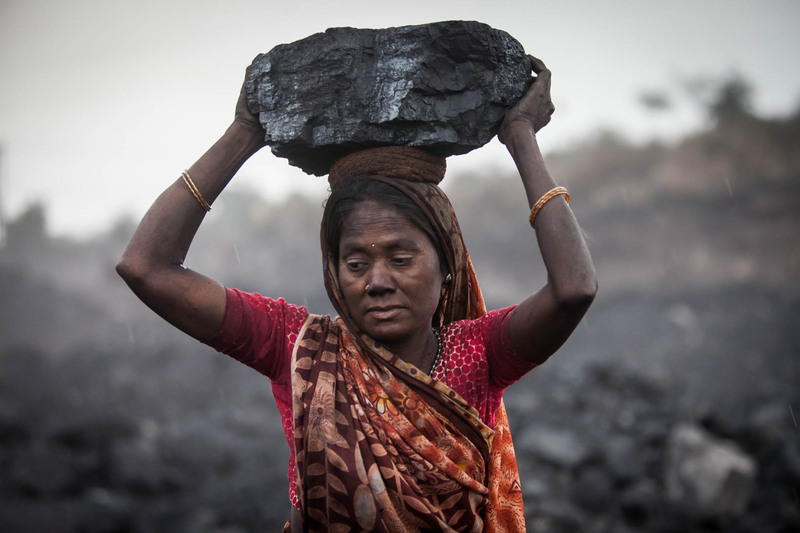 A woman is carrying a heavy chunk of coal on her head that she has collected from a government mine. A group of workers are transporting the coal that they have collected in the morning to a nearby truck. 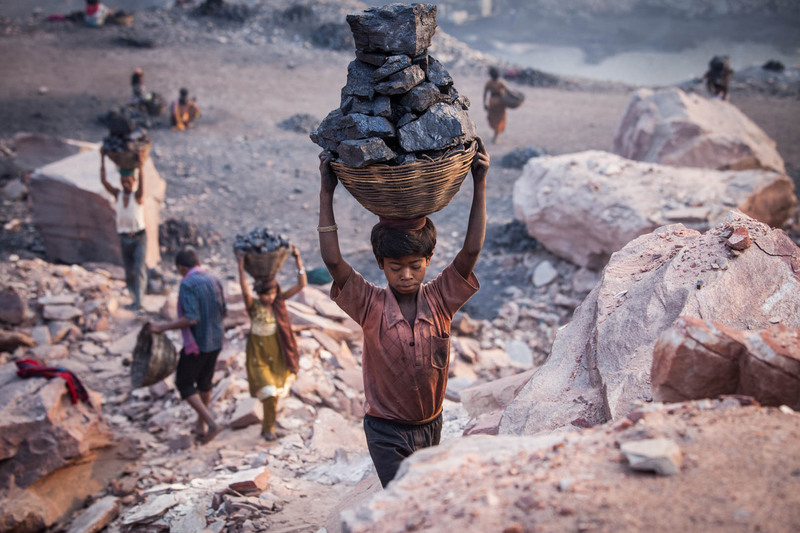 A small boy carries almost his own body-weight in coal on his head, after he collected the coal in a government-run mine near the city of Dhanbad. Some of the kids collecting the coal are as young as six years old. 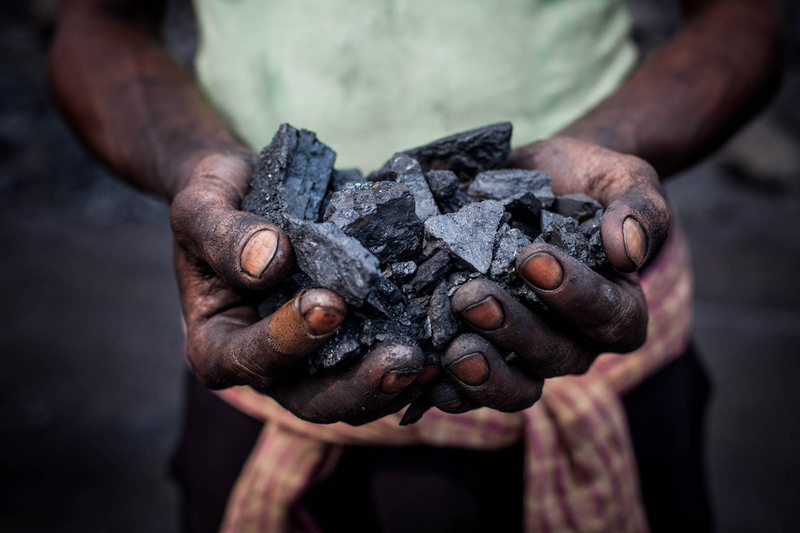 A worker shows a pile of coal that he is holding between his hands. 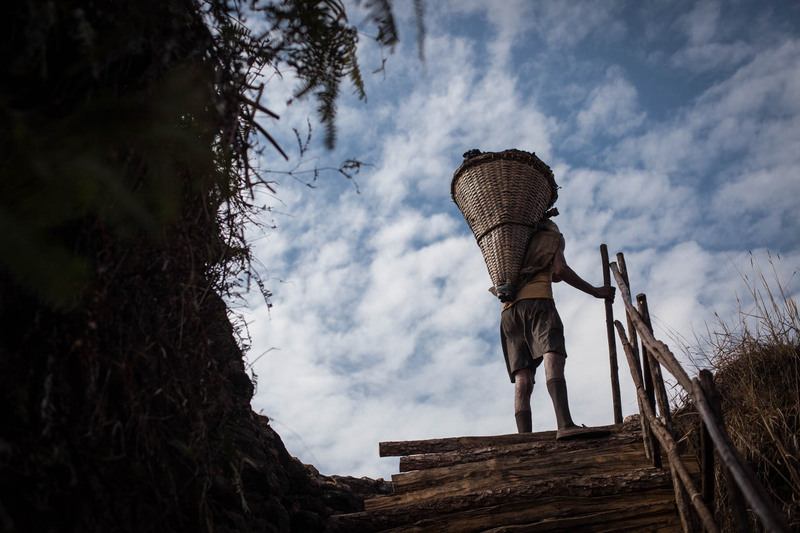 A young woman is carrying coal in a basket to a collecting spot. Men and woman alike miss school and other educational opportunities for their work in the mines. 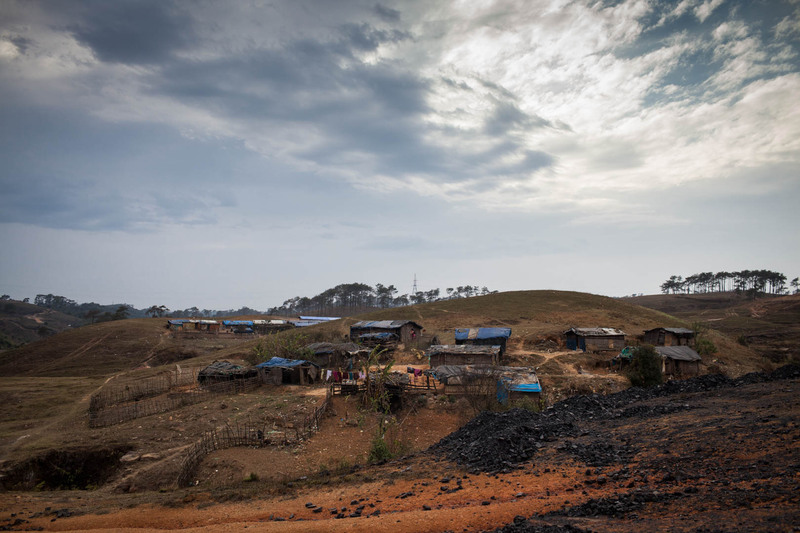 In the north-eastern state of Meghalaya, a different kind of illegal coal-mining has flourished: Because of total absence of police or authorities, business men set up underground mines in order to exploit the ground for coal. This man is carrying around 70 kilos or coal around 30 meters to the surface. With the work in the underground mines in Meghalaya being one of the hardest jobs in India, even many Indians refuse to do this kind of work. 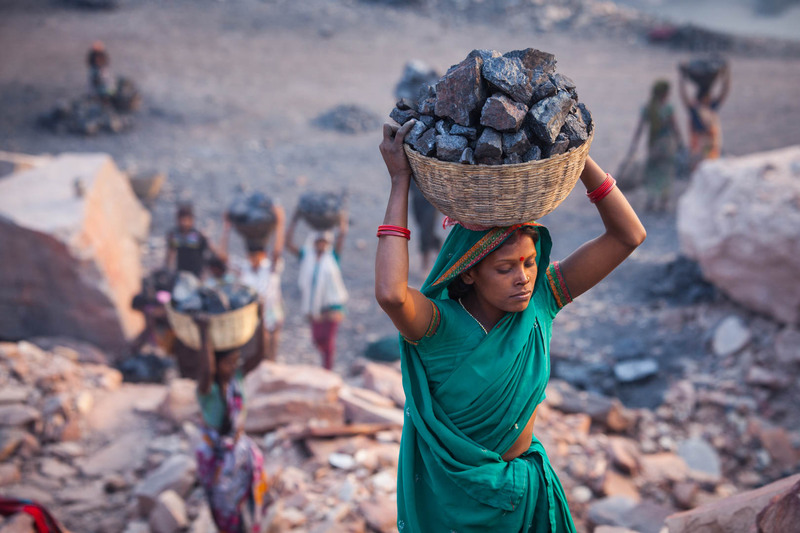 Here, a worker from Nepal is shovelling coal. 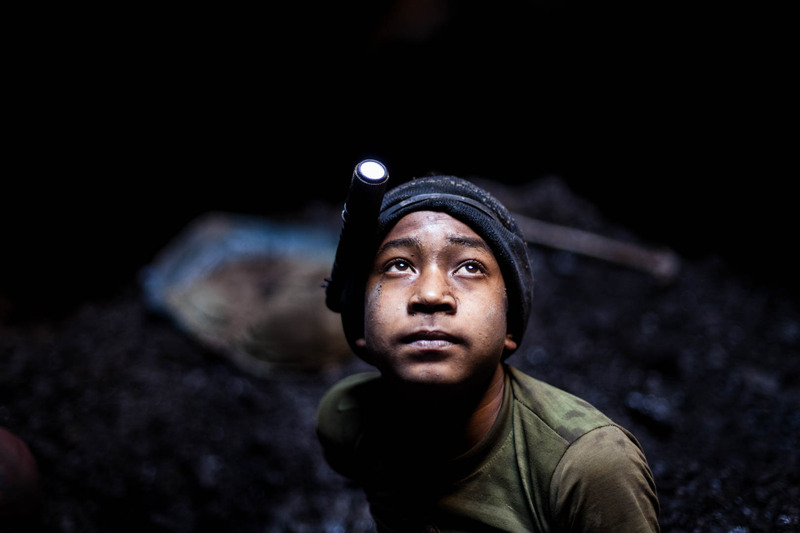 Ashok, an eight year old boy from India, works in the mines since he is five years old. He starts to dig for coal at five in the morning and finishes by 3PM. He says he prefers making money over going to school. 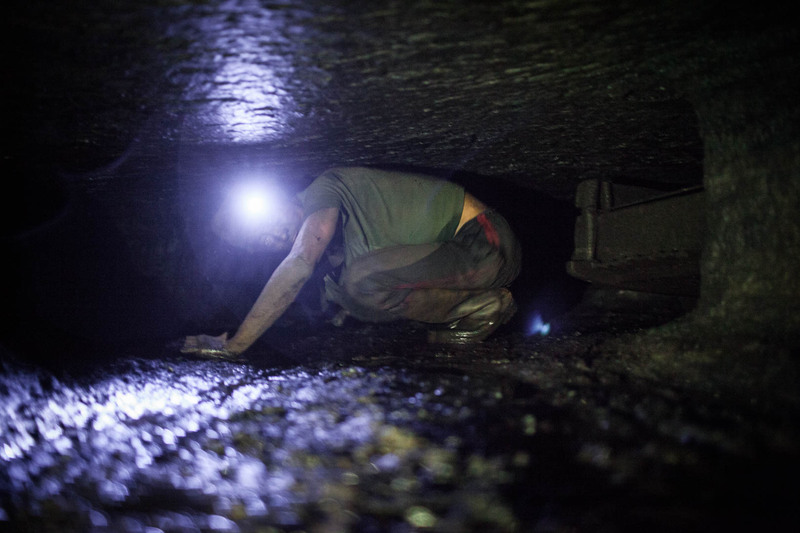 A worker reached the surface after carrying about 70 kilos of coal out of a 30 meter deep underground mine. 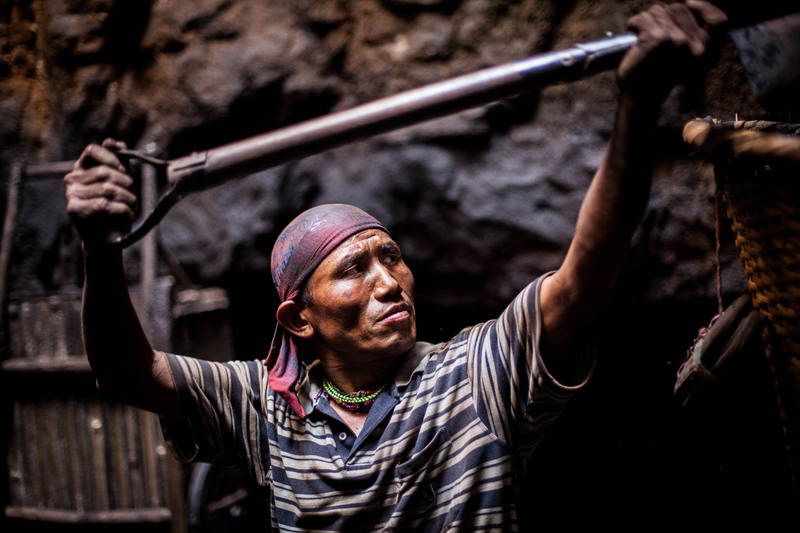 Many workers and their families live right next to the mines in order to save money. They lack basic infrastructure like electricity, water or sanitary areas. The closest cities are about 15 minutes away - by car. 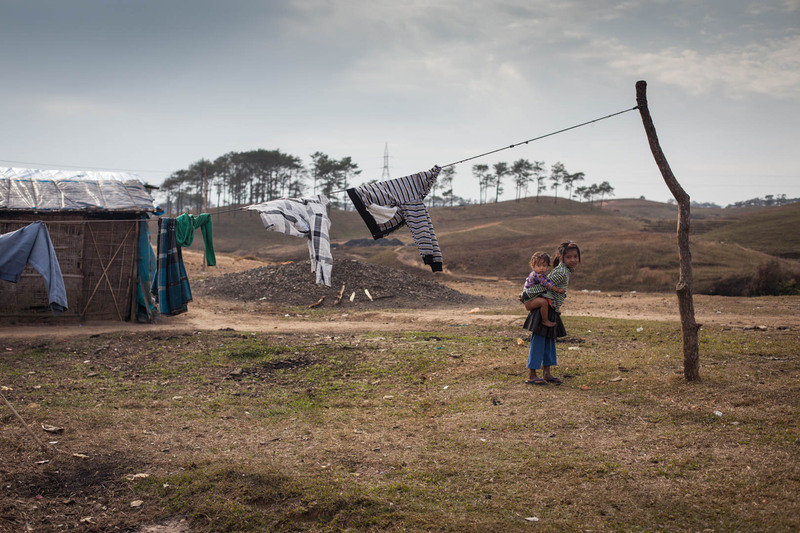 A small village of coal miners in a remote area in Meghalaya. With their major disconnection to any kind of entertainment or education, the miners and their families turn to drinking Whisky in their leisure time to distract themselves. 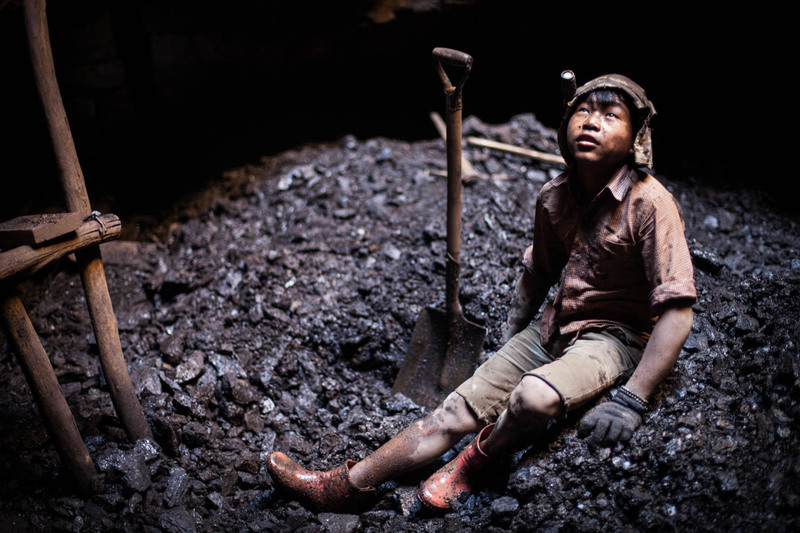 A boy from Nepal takes a break in an deep-shaft mine. His only protection equipment in the mines is a cap, gloves and rubber boots. Ashok and a friend at the entrance to a tunnel in an illegal underground mine in Meghalaya. They work six days a week, and around 10 hours a day, depending on the weather and how fit they feel. 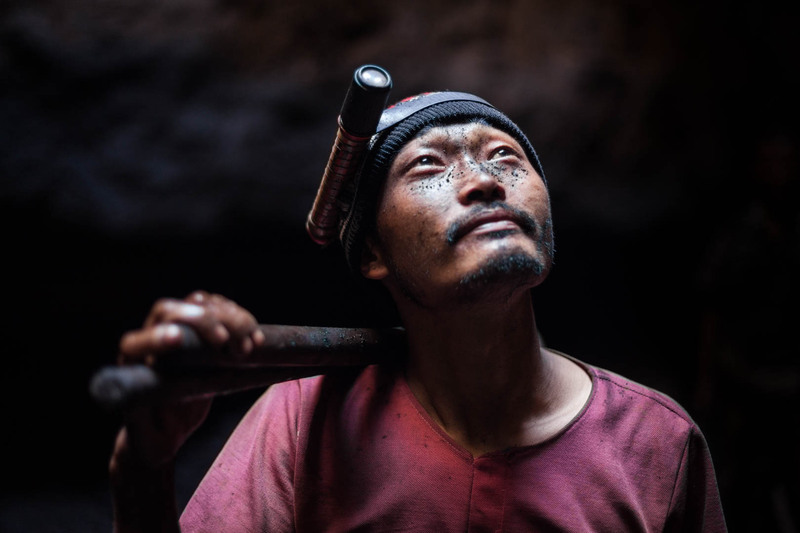 A guest worker from Bhutan looks to the surface in a mine that is about 40 meters deep. The workers from an underground mine take a break at the surface, sharing cigarettes and affections. An Indian worker robs through a tunnel in one of the underground mines. Due to the illegal nature of the tunnels, the absence of government, and the greed of the mine owners, they lack any ventilation, stabilization or illumination. 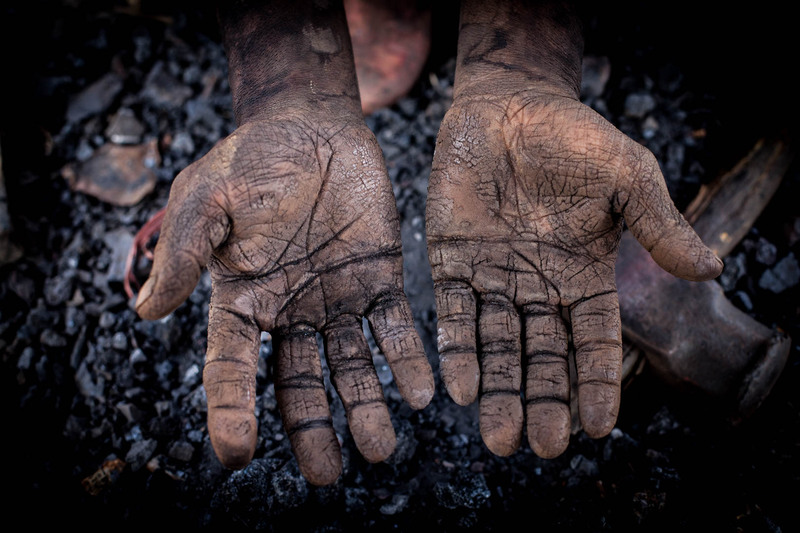 The hands of a coal miner at the end of his shift. They look like the varnish of an old oil painting. 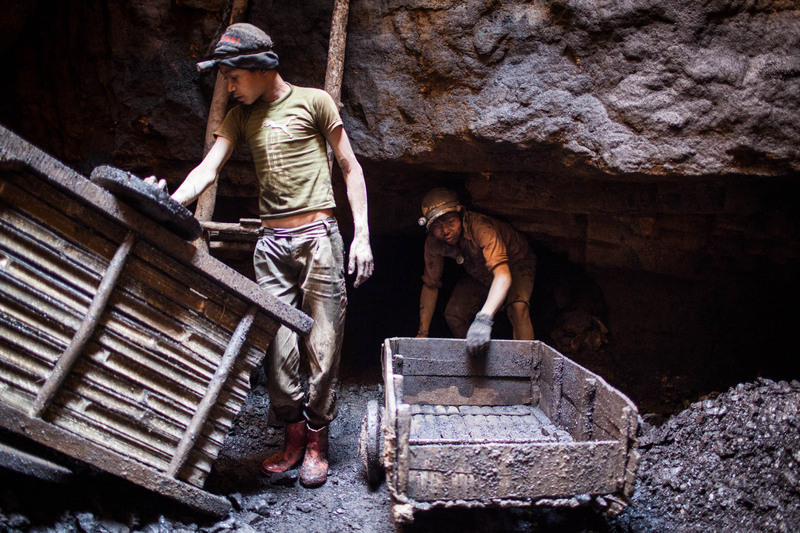 When the government has exploited all the coal from a open-cast mine, they usually extend it. That also means that people living very close to the mine have to be resettled. 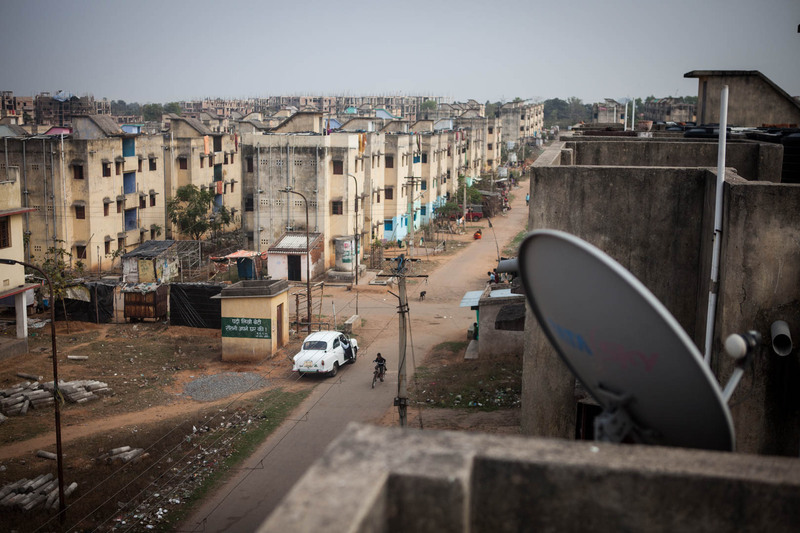 The Indian government build cities like these far away from the mines. Many resettled mine workers complain the absence of hospitals or schools in these cities, and that there are no bus connections to bring them to their work-places in the mines. 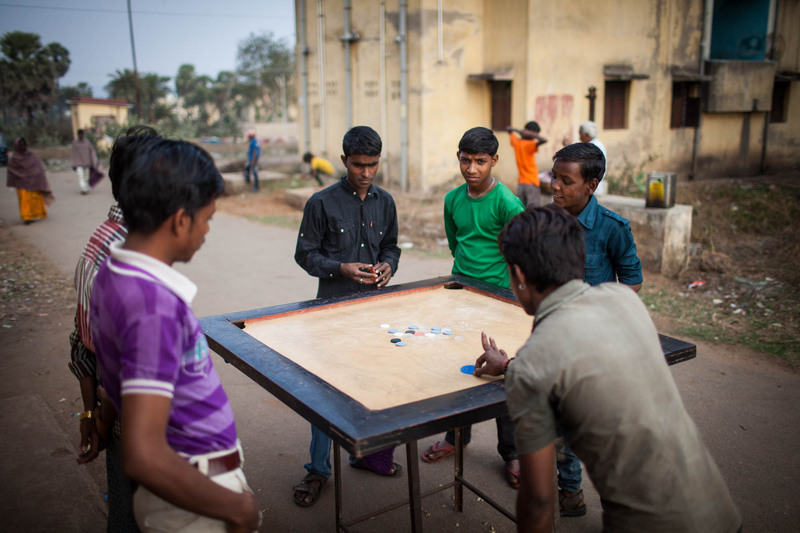 A group of young people plays a game in a resettlement city to find some distraction. 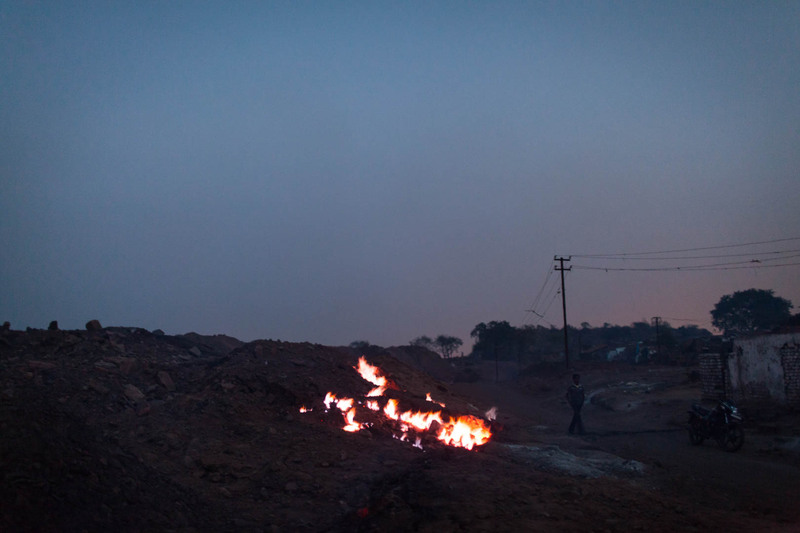 A coal-fire burns at dusk near a mine in Dhanbad. 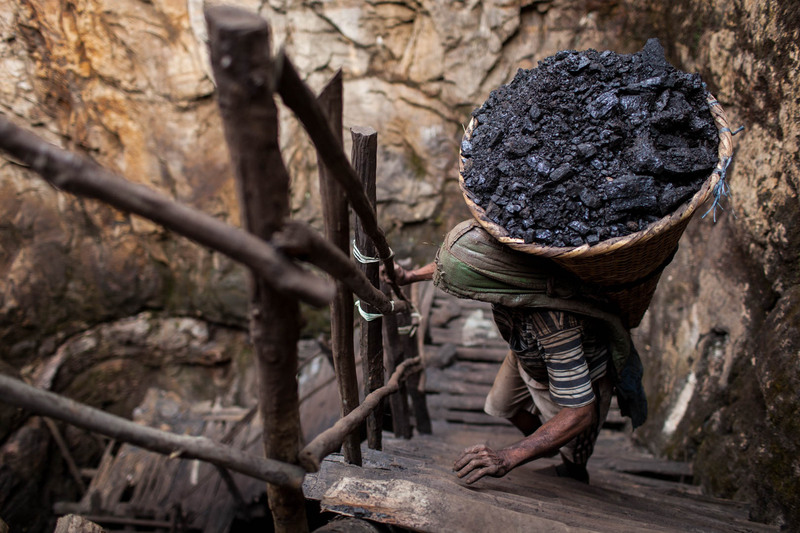 In the North-Eastern states of Jharkhand and Meghalaya in India, far away from the tourist masses on the beaches, coal is the only source of income for vast layers of the whole society. In a country like India, where corruption and the government’s inability to enforce law blooms, regular folk does about everything to earn money. Therefore, one can easily find the complete absence of environment protection, industrial safety or the ban of child labour. 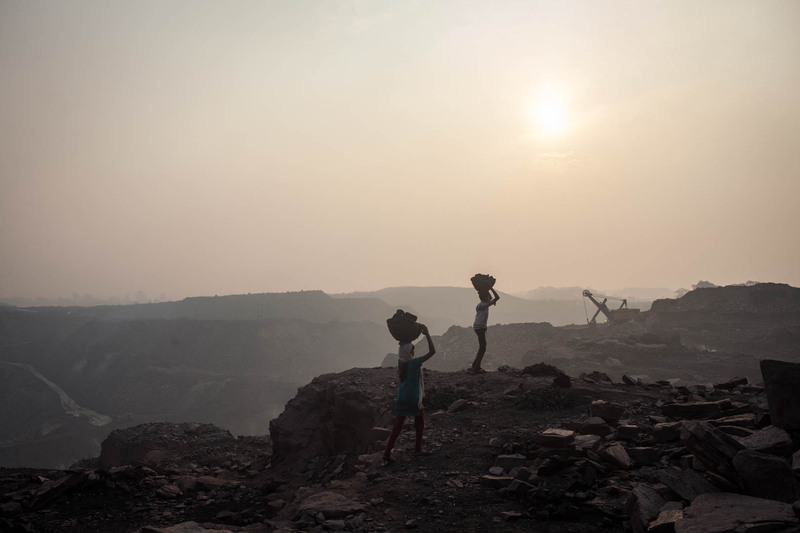 Many Indians, including kids sometimes not older than eight years, are forced to either steal coal from open-cast mines operated by the government or to work in deep-shaft mines called “ratholes”. In these mines, there is neither ventilation, protection, lighting, support of walls, or heating. It’s cold and wet, and many miners don’t get older than 50 because of lung infections or because they die during work. Most of them live right next to their place of work, exposing them directly to dangerous fumes from coal fires or from the extension of open-cast mines, resulting in the loss of their homes, or resettlement to remote villages. © Philipp Breu Photography. All Rights Reserved.